This article is about Reaper's March Character. For the Shornhelm character, see Abadi. 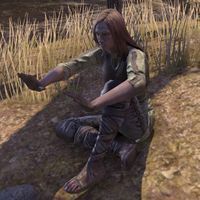 Abadai is a Redguard who can be found in the wilderness arguing with Parriot Conele about lighting their campfire. If you light it for them, Abadai and Parriot will both be grateful and you will be granted a small amount of XP and a status effect called "Firelight" for 30 minutes, which increases your maximum Stamina by 5%. This page was last modified on 22 October 2017, at 01:18.